Do you still need a laptop in the world of tablets? It seems the computing world is moving on. According to research firm NPD, tablets will out-ship laptops in 2013. While laptops will still outnumber tablets in terms of active usage for the foreseeable future, the tide is certainly shifting. It appears that consumers are really starting to ask themselves whether they really need a new laptop, of if they can get by with a tablet as their portable device. If you are planning to purchase a new portable computer in 2013, you might be asking the same question. As with any technology purchase, which usually has long-term implications, the answer is never simple. 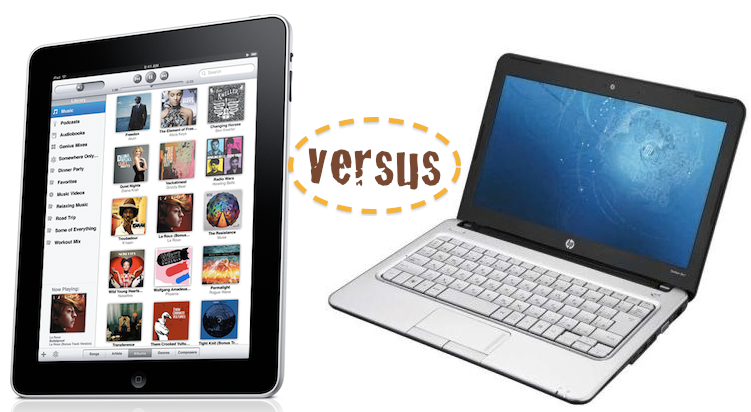 There are many factors that determine whether an individual is better off with a laptop or a tablet. Is it your primary device? Tablets run mobile operating systems, which gives them many advantages. Since they're less resources intensive, tablets can be much smaller and lighter weight than laptops. But with those advantages come some downsides. The limitations on mobile operating systems makes them poor primary devices. Tablet buyers should also have a PC, whether a desktop or a laptop, as a primary device. The tablet might do the bulk of the work, occupying most of a user's browsing and internet-based computer time. But the desktop is there to do heavy lifting tasks, such as word processing and other tasks familiar to PC users. Downloading and syncing files also becomes much easier when using a primary PC. Are you word processing heavy? Tablets have come a long way in terms of typing. The on-screen keyboards on the iPad and Android tablets are quite usable. They might take a few weeks of acclimation, but for the most part users will grow accustomed to typing on the virtual keyboard. Even better, users can connect Bluetooth keyboards to tablets, making typing more familiar. Yet there are still big word processing problems with tablets. Common functions, such as Control-A, Control-C, and Control-V, will not work with most Bluetooth keyboards. The tablet operating systems just aren't programmed for them. If there is not some kind of connecting apparatus, as with the keyboard on the Microsoft Surface tablet, you'll have to find a solid surface on which to place the tablet and the keyboard. While that might not be a problem in some places, typing somewhere like a train or bus becomes problematic. Word processing works well when combined with a mouse, since it gives the user precise control. Most mice are not compatible with tablets, complicating a usually simple procedure. If you type a lot, a tablet might not be for you. Gaming on tablets has come a long way. In fact, the developing world of mobile games will soon become a major selling point for tablets. Yet those games are aimed at casual gamers and people looking to kill time. Because of a tablet's limitations, it simply cannot match the nuance of console or PC games. Even as tablets become more powerful, they still won't touch specialty gaming PCs. The Lenovo IdeaPad Y480, considered by many to be the best gaming laptop, will always be a few steps ahead of tablets, mainly because it has the capacity to hold a more powerful processor and video card. Serious gamers will still need that PC or laptop for the required power. For the sake of your sanity, the answer to this is hopefully No. Adobe's Flash became the primary video platform on the web some years ago, but has since fallen into disfavor. That's for good reason: Flash constantly crashes and causes many problems. It can bring a PC (and especially a Mac) to a grinding halt, and it crashes all the time. Everyone's life will become much easier once Flash is completely phased out in favor of HTML5 video standards. If you are one of the unfortunate souls who still relies on Flash for whatever reason, a tablet might not be the answer for you. The iPad completely lacks Flash in any capacity. While there is a legacy Flash application for Android, it is no longer actively supported. Even when it was supported, it was just as buggy and terrible as Flash on a PC. If you happen to need Flash for whatever reason, a laptop will likely serve you better. Many consumers will flock to replace their laptops with tablets in 2013, but it's not a trend everyone needs to follow. There are certain consumers for whom a laptop will work much better. Still, it is encouraging to see the move towards tablets. Perhaps the increased demand will lead to greater tablet functionality in the future.